Tesladyne employees have a sworn duty to think of solutions to the most bizarre problems. From giant fungus monsters to mad scientist dinosaurs, the action scientists do what they can to protect the world from the rogue science it isn’t ready to deal with. Of course, they will have to survive it first. 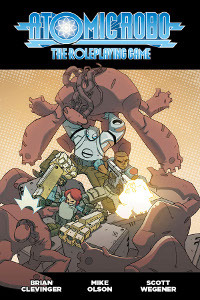 Atomic Robo the Role Playing Game is published by Evil Hat Productions, and based on the web comic created by Brian Clevenger and Scott Wegener. Support Fandible by purchasing through one of the links below.